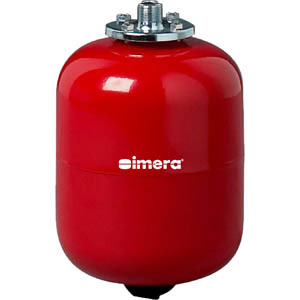 Imera has a complete range of expansion tanks with replaceable membrane. Expansion tank sizes range from 5 litres to 600 litres. Membrane Expansion Tanks are designed for hot and cold water closed circuit applications. They are used to protect closed water systems from excessive pressure. Expansion tank working temperatures are -10°C to 100°C. External tank enamel paint finish is colour RAL 3000 RED. Rubber membrane is constructed from EPDM rubber. 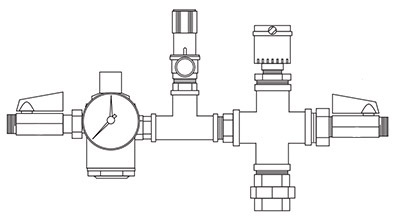 The Expansion Kit, or hook-up kit, is available for our tanks which incorporates automatic fill valve isolating valve, pressure relief valve and automatic air vent, all pre-assembled on a brass air separator. Imera models R 5 to RV 150 are top connections. The Expansion Kit can be screwed directly to the top of the expansion tank. Imera models RV 200 to RV 600 are bottom connections. These models require piping between bottom connection and Expansion Kit assembly. Imera expansion tanks work by absorbing the increased volume of water that occurs when it is heated. For example heating water from 0 degrees celsius to 100 degrees celsius increases its volume by about 4.5 per cent. Once the tank is connected to the system, the temperature increases and with it the water volume which then starts to fill the membrane. The water volume keeps increasing until the desired temperature is reached and at this stage the membrane occupies almost all of the space inside the tank. Contact between the water and the internal surface of tank is avoided with the use of a pressurised air cushion. When the temperature gradually decreases so does the water volume and then due to the pressure of the air cushion the water starts to come out of the tank until the membrane is again its original size. A new cycle then begins.